Popular notions tend to group the later Eastern Roman realm, or more specifically the Byzantine Empire, as a strictly medieval entity that encompassed Greece, the surrounding Balkans, and the Anatolian landmass. But if we take the impartial route that is ‘bereft’ of prejudiced medieval European politics and chronicling, the Byzantine Empire was the continuation (and even represented endurance) of the Roman legacy, so much so that most of its citizens called their realm Basileia tôn Rhōmaiōn – the Roman Empire. To that end, the very term ‘Byzantine’ in spite of its popularity, is a misleading word. 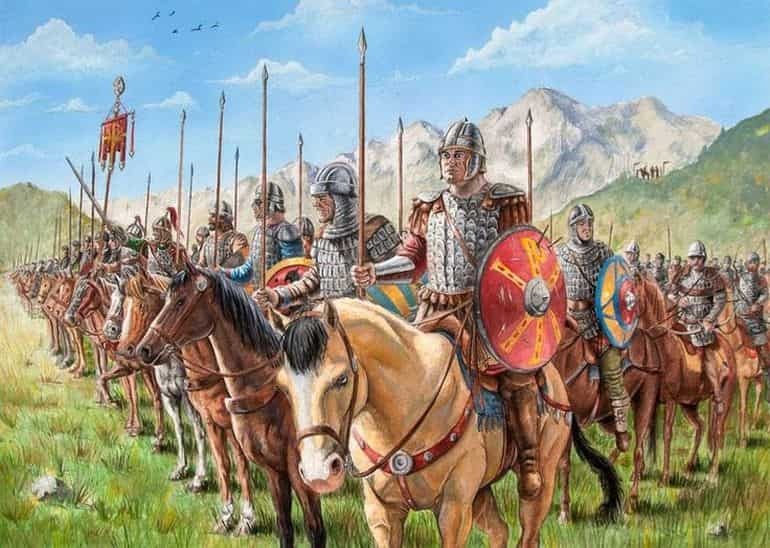 So without further ado, let us equitably delve into the ten fascinating things you should know about the early medieval (Eastern Roman) Byzantine army. Note* – In spite of its slightly fallacious nature, we will continue to use the term ‘Byzantine’ instead of ‘Eastern Roman’ in the following article, for the sake of clarity (for most readers). As we mentioned before, the term ‘Byzantine’, as opposed to Eastern Roman, is rather a medieval invention that sort of takes an uncomplimentary route – partially based on the prejudices of medieval chroniclers. In fact, to that end, the word ‘Byzantine’ is rather deprecatory even in our modern world, with its association often made to “deviousness or underhand procedure” (Oxford Dictionary). In essence, such biased views were often concocted by the contemporaries of the Eastern Roman Empire, who perceived the political scope and ploys favored by the Romans as being overly complicated and labyrinthine. However, as historian Ian Heath wrote (in Byzantine Armies 886-1118 AD) – in spite of such misunderstood labeling and anachronistic slanders, the Byzantine army of 10th century AD was possibly the “best-organized, best-trained, best-equipped and highest-paid in the known world”. Simply put, the Byzantine army from this particular epoch was the closest to a professional force that served any known medieval realm. And this ambit of professionalism was rather reinforced by the favorable economic might of the empire, strengthened by an organized military system (that was different from their ancient Roman predecessors) and well-defined logistical support. The military manual of Strategicon (Greek: Στρατηγικόν) written by Eastern Roman Emperor Maurice in the late 6th century dealt with the general military strategies, and the renowned Tactica military treatise written by or on behalf of Byzantine Emperor Leo VI the Wise (circa early 10th century AD), drew heavily from this handbook. And both of these manuals talked about the basic military unit of bandon (or tagmata as mentioned in Strategicon), a word itself derived from the Germanic ‘banner’, thus alluding to the foreign influence in Byzantine army during the early medieval period. Now it should be noted that the number of troops within each bandon varied in accordance with the available manpower, which took into account the injured and the invalidated. In any case, on the theoretical level, by Emperor Leo’s time, a bandon possibly accounted for 256 men for infantrymen (comprising sixteen lochaghiai) and 300 men for cavalry (comprising six allaghia of 50 men each) – and each one was commanded by a komes or count. 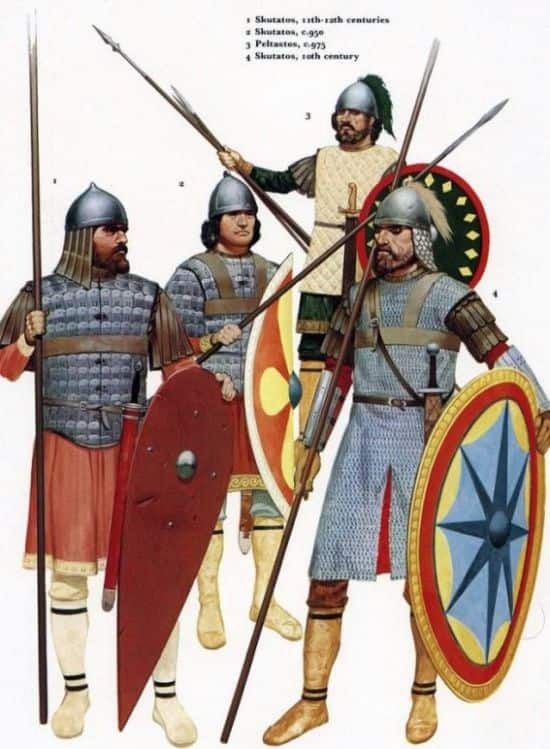 Interestingly enough, the Byzantine army did make use of ‘mixed’ divisions of soldiers within each bandon, with ratios of 3:1 to 7:3 when it came to spearmen (skutatoi) and archers, thus suggesting advanced tactical deployments on the battlefields. The banda (plural of bandon) was also used as the standard for determining bigger divisions, like moirai and turmai. To that end, a moira often contained variable numbers of banda, oscillating between 2 to 5 – possibly accounting for around 1,000 troops in the 10th century AD (as opposed to the norm of 2,000 men for each moirai in the 6th century AD). The turma, on the hand, comprised around three moirai, thus amounting to around 3,000 men. 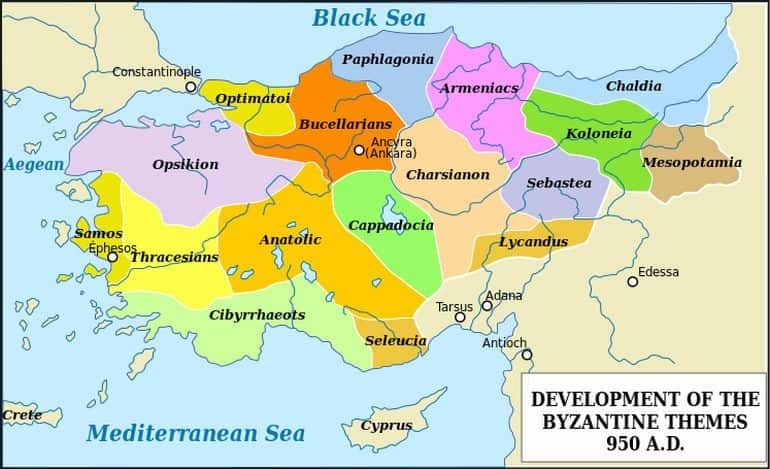 The Byzantine military from the 7th century to early 11th century AD was dependent on the Themata (or Themes) system, an administrative network of provincial armies that ironically preserved the Eastern Roman realm (more-or-less across Anatolia) and yet mirrored its ‘on the defensive’ state of affairs. Partly inspired by the provincial system set in place by Constantine the Great, the Themata – as we know today, was possibly established during the reign of Constans II, as opposed to the popular notion associated with Emperor Heraclius. In any case, the rise of this defensive force, initially based on the provinces of Anatolia, was probably fueled by the incursions of the Arabs on the eastern frontiers of the Empire. Furthermore, in spite of the non-uniformity of equipment showcased by different provincial troops, there was a minimum threshold of requirement expected from each farmer-soldier who held a land. For example, in the 9th century AD, the Byzantine administration passed a law that allowed poor Themata soldiers to band together to pay for a properly equipped mounted warrior. In rare cases (as legislated by Emperor Nikephoros II), some of the richer troops were obligated to furnish better equipment for their poorer military brethren. And during extreme situations, if the soldier couldn’t afford his arms and armaments – even after being offered aid from others, his land was promptly taken away. Consequently, he was drafted into the irregular divisions who were derogatorily called the ‘cattle-lifters’. So in essence, as opposed to 10th century feudal Europe’s wide gap between the early knightly class and the ‘rag-tag’ peasant infantry, the Byzantine army boasted a fairly consistent provincial military institution that was inclusive of variant soldier types – and the entire system was rather strengthened by an administrative network (though the scenario took a downturn by the second half of the 11th century). Akritai frontier soldiers on the left and center, accompanied by a heavy ‘Cataphract’ style cavalryman on the right. Illustration by Angus McBride. The basic unit of each Thema army possibly harked back to the aforementioned banda (each bandon ranging from 200 to 400 men), though in terms of practicality the provincial soldiers were occasionally organized into the bigger turmai. Suffice it to say, the strength of each provincial army varied, dictated by the population of the said province. For example, the Anatolikon province could possibly furnish around 10,000 soldiers, while the Armeniakon province could account for 9,000 troops. The smaller provinces, like Thrace, could approximately provide 5,000 provincial soldiers. And the overall strength of the Byzantine Themata army possibly numbered between 70,000 to 90,000 men, in circa early 10th century AD. Now as historian Ian Heath noted that some of the themes were further divided or even expanded, based on the political and military scenario of the period – which, in turn, had an effect on the manpower of the province. Moreover, the Byzantine realm also had the strategic frontier themes, known as kleisourai (or ‘mountain passes’) that were mostly created from the border districts. These particular provinces tended to maintain a more autonomous army linked by forts and castles, and the battle-hardened soldiers were commanded by the border nobles known as the akritai. On occasions, even the younger sons of the ‘interior’ Thema landowners joined the ranks of border armies, thus militarily reinforcing many strategic locations of the Eastern Roman Empire. Scholai (standing one and the cavalryman) and Noumeroi (leaning one) guardsmen, along with the seated Emperor. Illustration by Guiseppe Rava. 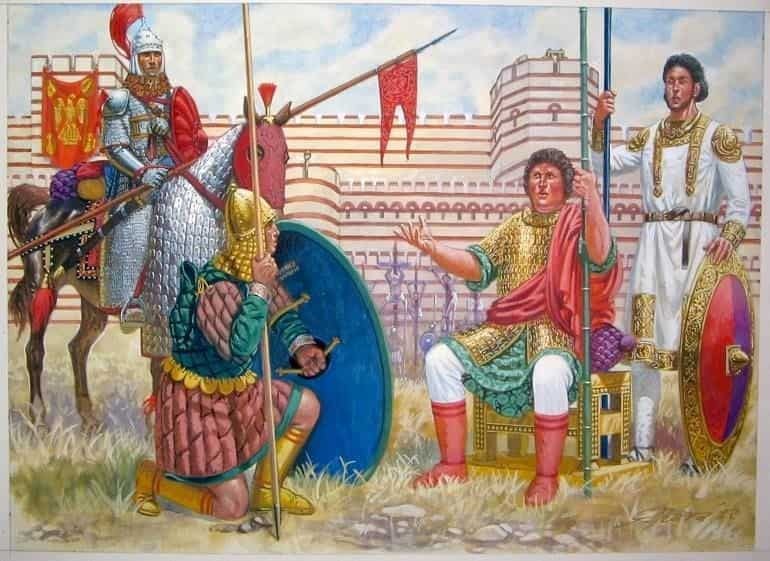 The Scholai (Σχολαί, ‘the Schools’), probably the senior-most unit in the Tagmata, were the direct successors of the Imperial Guards established by none other than Constantine the Great. The other three principal regiments that were considered among the Tagmata ‘proper’ are as follows – the Exkoubitoi or Exkoubitores (‘Sentinels’), the Arithmos (‘Number’) or Vigla (‘Watch’), and the Hikanatoi (‘the Able Ones’) who were established by Emperor Nikephoros I in early 9th century AD. There were also some other regiments that were occasionally counted in the imperial Tagmata roster, including the Noumeroi, who were possibly tasked with manning the walls of Constantinople; the Optimatoi (‘the best’), who, in spite of their name, were relegated to a support unit that maintained the baggage train and garrisoned the nearby areas outside the capital; and the Hetaereia Basilike (“the Emperor’s companions”), who probably comprised a mercenary regiment composed of foreigners. There were also situations when men of the Imperial Fleet were inducted into the Tagmata units. Now when it comes to the number of soldiers of the Byzantine Tagmata, there is a lot of debate in the academic world. Early medieval sources rather mirror this state of confusion, with Procopius writing in the 5th century on how the Scholai was made up of 3,500 men. 10th-century Arab author Qudamah talked about how this number possibly rose to 4,000 per Tagma regiment in the 9th century. However, yet another Arab author, Ibn Khordadbah mentioned how the total strength of the Tagmata army was 6,000 (which makes it 1,500 men per regiment), and they were supported by 6,000 servants. And finally, another historical source of the 10th century described how the Emperor in the campaign should be supported by at least 8,200 horsemen (all of these figures are mentioned in ‘Byzantine Armies 886–1118′ by Ian Heath). 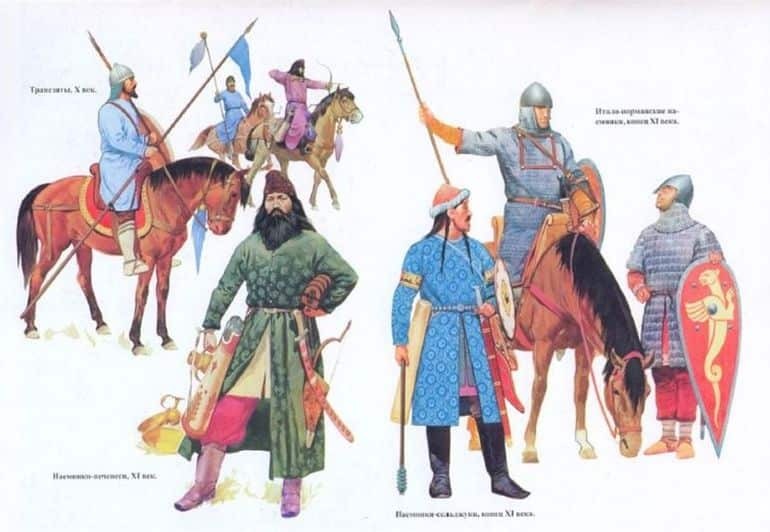 Presuming these horsemen to be from the Tagmata, we can surmise that in normal scenarios, the Emperor possibly boasted over 12,000 elite troops – and the number possibly even crossed 25,000 in the later decades of 10th century. The very term ‘Cataphract’ (derived from Greek Kataphraktos – meaning ‘completely enclosed’ or ‘armored’) is historically used to denote a type of armored heavy cavalry that was originally used by ancient Iranian tribes, along with their nomadic and Eurasian brethren. To that end, the Eastern Romans adopted the cataphract-based mounted warfare from their eastern neighbors – the Parthians (and later Sassanid Persians), with the first units of the heavy cavalry being inducted into the Roman Empire army as mercenaries (probably raised from mounted Sarmatian auxiliaries). 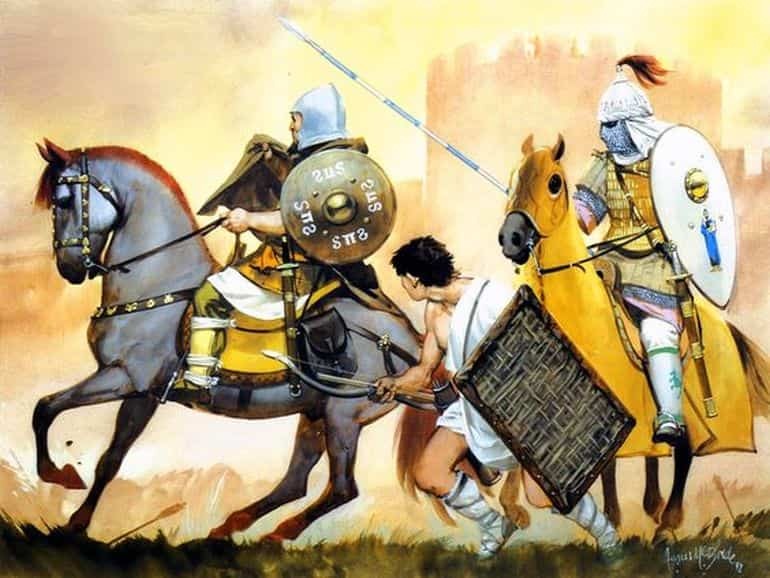 And interestingly enough, the subsequent Byzantine army maintained its elite units of cataphracts from antiquity till the early middle ages, thus ironically carrying on the tradition of eastern equestrianism. 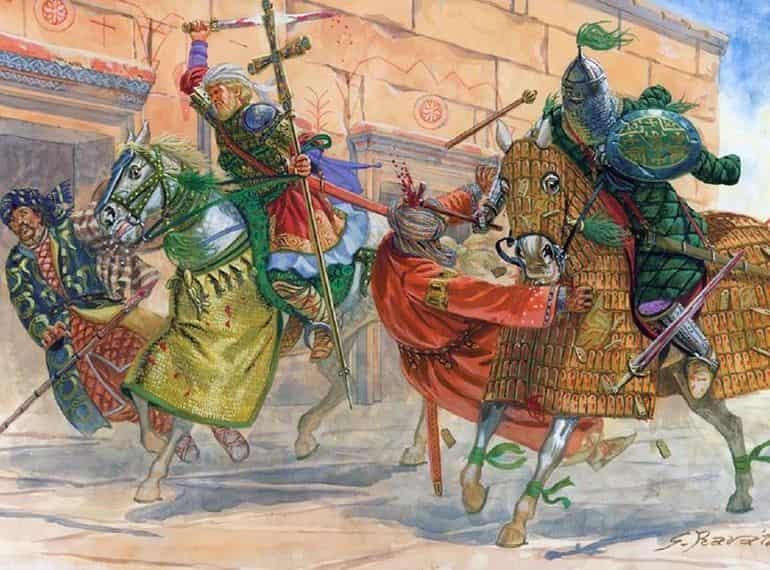 In any case, the Eastern Roman Cataphract of the Byzantine army fielded till the 10th century, was known for its super-heavy armor and weapons (that included maces, bows, and rarely even javelins). 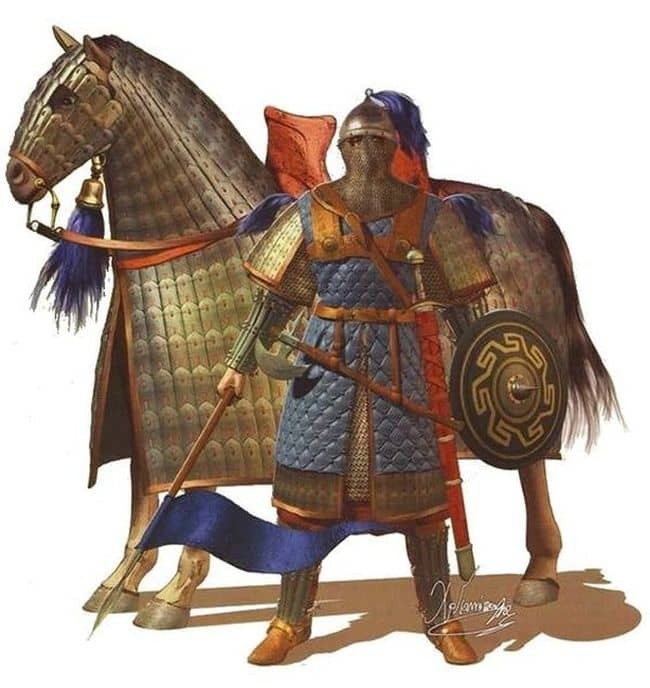 Typical contemporary descriptions of the cavalrymen mention the use of klibanion, a type of Byzantine lamellar cuirass that was crafted of metal bits sewn on leather or cloth pieces. This klibanion was often worn over a mail corselet, thus resulting in a heavy ‘composite’ armor, which was further reinforced by a padded armor worn under (or over) the corselet. This tremendously well-protected scope was complemented by other armor pieces, like vambraces, greaves, leather gauntlets and even mail hoods that were attached to the helmet. Now in terms of military history, the Kataphraktoi or their brethren Klibanophoroi (a super heavy cavalry unit revived by Emperor Nikephoros II Phokas) certainly required costly equipment and armaments, which could have possibly limited these units only to the Tagmata army. It is also interesting to note that Emperor John I Tzimiskes raised another unit of heavily armored shock cavalry – known as the Athanatoi (or ‘Immortals’). According to contemporary sources, these cavalrymen were draped in exquisite armor, described as “armed horsemen adorned with gold”. 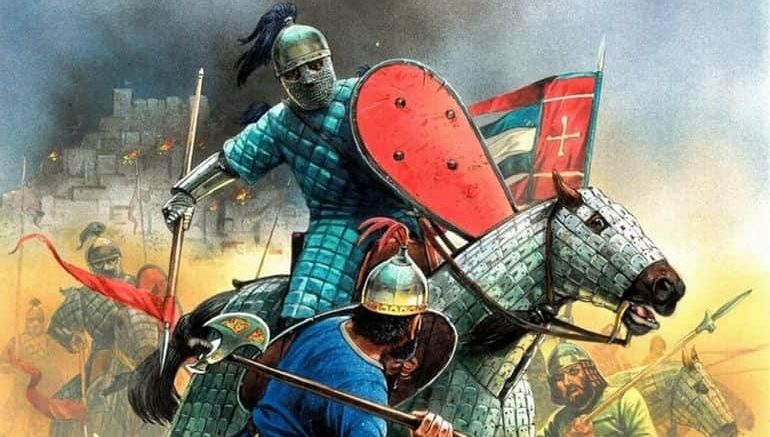 We discussed at length about the Varangian Guards, probably the most renowned of all Byzantine army units, in one of our articles dedicated to the mercenary regiment. 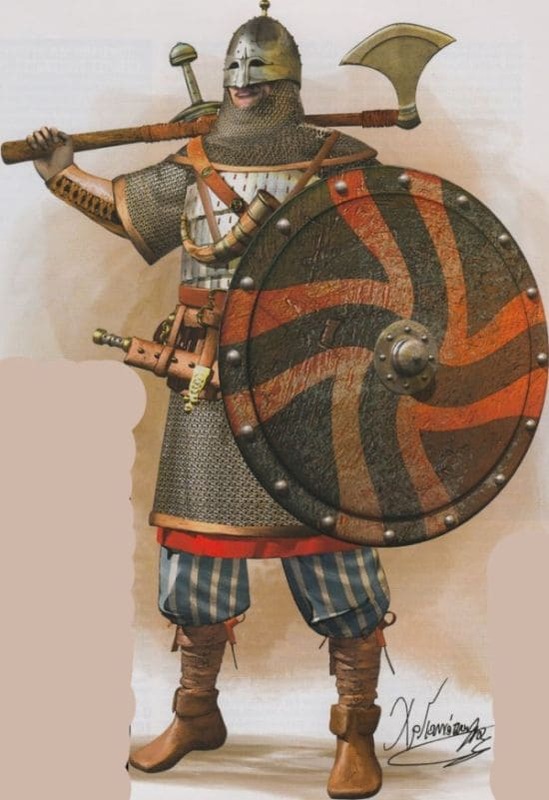 Pertaining to the latter part, the Varangians Guards were indeed employed as mercenaries as opposed to guard units like the Scholai and Exkoubitores. Now employing mercenaries was a trademark of Byzantine military stratagem even in the earlier centuries (as we discussed in the last entry). But the recruitment of the Varangians (by Emperor Basil II in 988 AD) was certainly different in scope, simply because of the loyalty factor. In essence, the Varangians were specifically employed to be directly loyal to their paymaster – the Emperor. In that regard, unlike most other mercenaries, they were dedicated, incredibly well trained, furnished with the best of armors, and most importantly devoted to their lord. And unlike other imperial guard regiments, the Varangian Guard was (mostly) not subject to political and courtly intrigues; nor were they influenced by the provincial elites and the common citizens. Furthermore, given their direct command under the Emperor, the ‘mercenary’ Varangians actively took part in various encounters around the empire – thus making them an effective crack military unit, in contrast to just serving ceremonial offices of the royal guards. In any case, the popular imagery of a Varangian guardsman generally reverts to a tall, heavily armored man bearing a huge ax rested on his shoulder. This imposing ax in question entailed the so-called Pelekys, a deadly two-handed weapon with a long shaft that was akin to the famed Danish ax. To that end, the Varangians were often referred to as the pelekyphoroi in medieval Greek. Now interestingly enough, while the earlier Pelekys tended to have crescent-shaped heads, the shape varied in later designs, thus alluding to the more ‘personalized’ styles preferred by the guard members. As for its size, the sturdy battle-ax often reached to an impressive length of 140 cm (55-inch) – with a heavy head of 18 cm (7-inch) length and blade-width of 17 cm (6.7-inch). And lastly, it should also be noted that the Varangians mostly played their crucial roles after the military peak of the Byzantine army (post 11th century) – an epoch that is not the focus of our article.